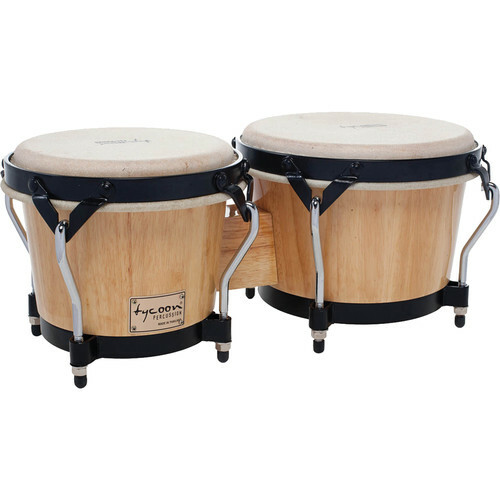 The natural 7" & 8.5" Supremo Series Bongo Set from Tycoon Percussion is designed for students and percussion enthusiasts. The 7" & 8.5" attached bongos are constructed of durable Siam Oak wood and a high-gloss natural finish is applied. The drums feature black powder-coated Classic-Pro hoops and large 5/16" diameter lugs. The water buffalo skin heads are designed to produce crisp tones. This set includes a tuning wrench. A matching conga set and djembes are available (sold separately). 7" & 8.5" Supremo Series Bongo Set (Natural) is rated 4.0 out of 5 by 1. Rated 4 out of 5 by teleosus from Am Pleased With My Purchase, especially for Quality/Value First I am no Bongo expert and I have only had these for 1 week but after doing some research before buying, I realized that you have to spend a bit to get anything worth playing well. I have looked these over closely, the hardware is reasonably sturdy with rivets holding the tension loops to the upper ring. The skins are reasonably thick, although I may eventually change them out for synthetic for ease of maintenance. The oak bodies are very hard and well finished with a thick coat of clear acrylic. The tension nuts are regular 5/16 size and work fine but I may get some longer barrel type for a more secure bite on the threads. When the drums are tuned up, they put out a lot of what you would expect a good bongo set would sound. I am pleased and would recommend them to a friend, more definitely so if they thought they could buy some worthwhile bongos for anything less. Now..., time to practice.